The walls are the largest expanse of space to be decorated in your wedding hall, but don't be overwhelmed. Using photos is not only a cheerful way to break up a large expanse of wall, it will become a talking point for your guests throughout the day. Create a Wedding History Wall - Ask your friends and family to contribute a picture of them on their wedding day. 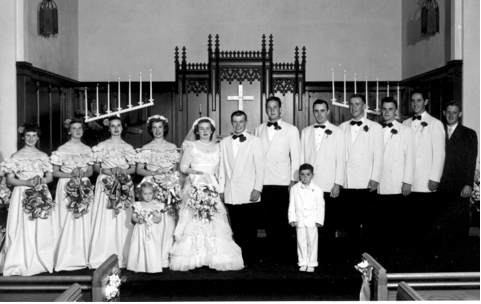 If they are family members they might also like to offer a picture of their parents on their wedding day, so you have many generations of both sides of the family still present in some way on your special day. If you have the time, then you could arrange this on a large family tree format to decorate the walls. The History of the Happy Couple - Have one wall be just about the newlyweds. Start at one side of the wall with you as baby, and the other side of the wall for your spouse, and advance towards the center of the wall with eventually the two of you meeting in the middle - a willing guest might even oblige by getting a snap processed quickly for you of that 'just married' picture, to complete the wall. Create a Photo Tree - A photo tree doesn't even have to be a tree, it could just be pictures tacked to the wall, or pinned to some fabric. You may also consider using an artificial tree (you could even repurpose a Christmas tree). Get a willing volunteer to take Polaroids of your guests as they enter the venue, and hang them up on the tree. This also gives the guests a keepsake to take home. 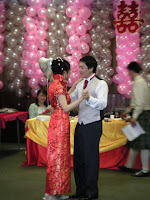 There is no cheaper way to decorate a wedding hall than with balloons - be prepared and use a pump though! Get some fishing line and tie balloons along it, alternating each side. String in swag style, horizontally across the wall, or create an entire wall of balloons, as in this picture. Create a soft feel, and use some inexpensive tulle to cover the walls in swags. Create a large wedding bow to affix at each interval and to cover up where you've stapled the fabric to the walls. Add further detail by using greenery such as long strings of ivy, faux greenery, or tissue paper flowers. The ceiling of a wedding venue often gets neglected, but has the power to add a real wow factor to the hall. 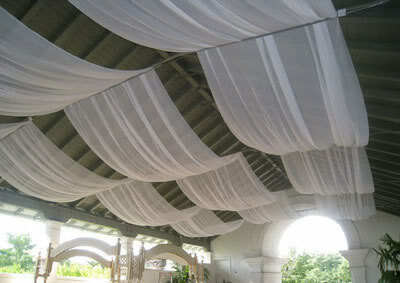 One approach you might like to take is by creating a tented ceiling. You will need large amounts of fabric, but it can be inexpensive sheer fabric like tulle, or even use cheap calico. If you have the time then use a hot glue gun to randomly stick pieces of diamond vase filler to the fabric beforehand, to create a ceiling that shimmers. Simply use a staple gun to attach one length of fabric to the center of the room, and then pull it over to the edge of the wall, again using staples to fix it into place. 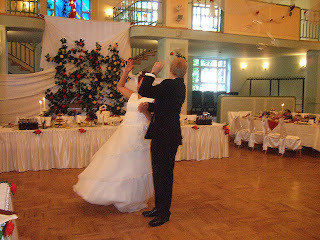 A small wedding hall would benefit from some hanging decorations. Get hold of some polystyrene balls and cover them with faux greenery, or tissue paper flowers - hang from the ceiling at different heights using fishing line. Depending on the theme of the wedding, a piñata over each table would make for a colorful decoration and keep the kids happy too. With the main sections of the wedding hall decorated, you need to fill in the gaps and add those finishing touches to make the look complete. 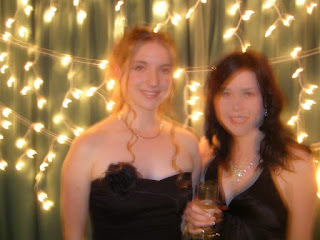 One addition guaranteed to make any wedding venue feel more magical, is fairy lights (mini Christmas style lights). Predictable, sure, but an inexpensive way to add romance - like the wedding equivalent of dusting powdered sugar over a cake to make it look nicer, fairy lights are always a winner. String them from the walls, ceilings, or through your floral arrangements. Hire some floral/vase stands and decorate with tulle, in the same way you would tie a chair back bow. Place large clear bowls on them filled with candy - large sweets like marshmallows and gumballs work particularly well. Even if you have a large space to fill, using these wedding hall decor ideas will ensure you have a unique and stylish wedding venue, that will be one of the most inexpensive parts of your day.